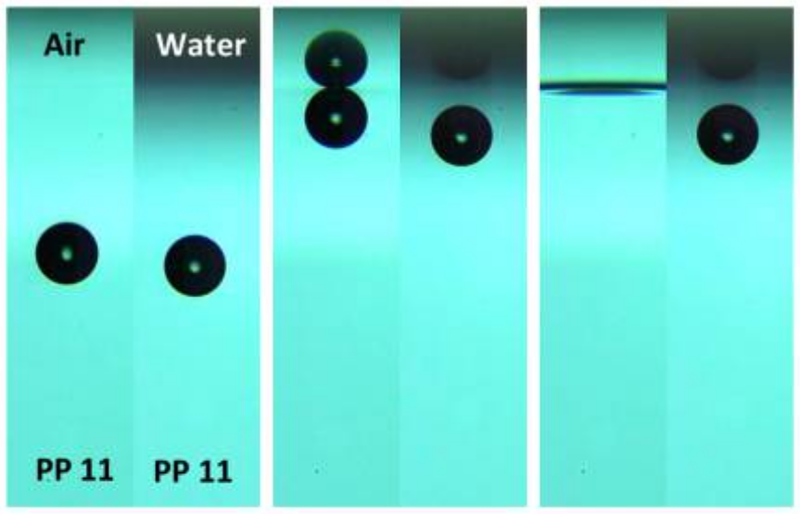 Coalescence dynamics between deformable bubbles and droplets can be dramatically affected by the mobility of the interfaces with fully tangentially mobile bubble−liquid or droplet−liquid interfaces expected to accelerate the coalescence by orders of magnitude. However, there is a lack of systematic experimental investigations that quantify this effect. By using high speed camera imaging we examine the free rise and coalescence of small air-bubbles (100 to 1300 μm in diameter) with a liquid interface. A perfluorocarbon liquid, PP11, is used as a model liquid to investigate coalescence dynamics between fully mobile and immobile deformable interfaces. The mobility of the bubble surface was determined by measuring the terminal rise velocity of small bubbles rising at Reynolds numbers, Re, less than 0.1 and the mobility of free PP11 surface by measuring the deceleration kinetics of the small bubble toward the interface. Induction or film drainage times of a bubble at the mobile PP11−air surface were found to be more than 2 orders of magnitude shorter compared to the case of bubble and an immobile PP11−water interface. A theoretical model is used to illustrate the effect of hydrodynamics and interfacial mobility on the induction time or film drainage time. The results of this study are expected to stimulate the development of a comprehensive theoretical model for coalescence dynamics between two fully or partially mobile fluid interfaces.